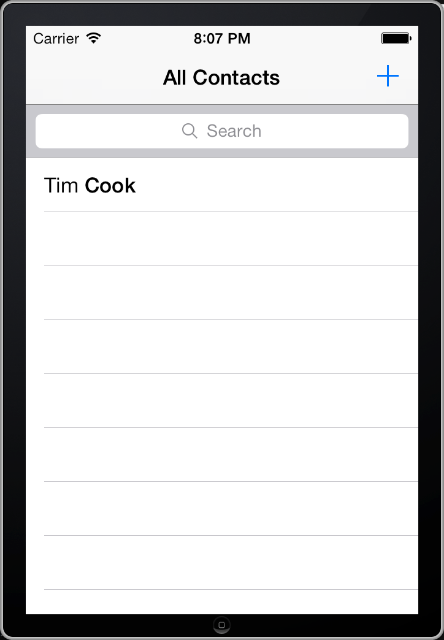 The AddressBook framework in iOS 7 allows you to interact with the address book database on the device. You can get the accounts properties of the user’s address book, insert and change values, and much more. In this tutorial we will insert a contact in the address book. For retrieving values out of the address book, i refer to this tutorial. Open Xcode and create a new Single View Application. For product name, use iOS7AddressBookTutorial and then fill out the Organization Name, Company Identifier and Class Prefix fields with your customary values. Make sure only iPhone is selected in Devices. Go to the Storyboard and drag two labels to the main View. Give them a title of "First Name" and "Last Name". Next, drag two textField to the main view and place them to the right of the labels. 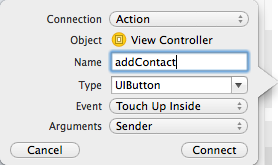 Next, drag a button to the main view and give it a title of "Add Contact".The storyboard should look like this. - 1. The ABPersonCreate function creates a new account record. -2. With ABRecordSetValue we set the firstName and lastName property of the record. -3. With the ABAddressBookAddRecord function we add the record to the addressbook. -4. With the ABAddressBookSave we will save unsaved changed to the address book database. That's it. Build and Run the application and fill in a first and last name. Press the Add Account button. Go to the Contacts app to view the address book. Our newly added account should be displayed. You can download the source code of the iOS7AddressBookTutorial at the ioscreator repository on github.